As they say, there are bags and then there’s the Birkin. A real epitome of luxury, to say the least. Take this one divine evening bag for example. 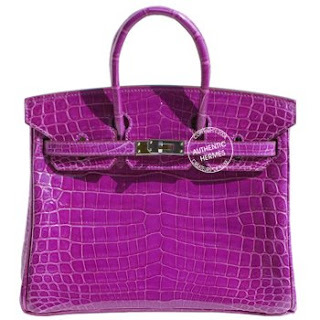 It is the 25cm Birkin, Shiny Violet Crocodite “Niloticus.” This ladies handbag costs a staggering $32,000. A luxury only the likes of Victoria Beckham or Paris Hilton can afford. Ah yes, and some other Hollywood stars and big time business magnate. I just don’t imagine anyone in her right mind stashing more than 1.3 million pesos out of her bank account just for this baby. Even the best payday loan won’t give you the fulfillment of finally owning your very first Hermes. Truth to tell, Birkin bags are not as recognizable as other high end bags like Prada, Louis Vuitton and the like. I bet anyone could wear one of these flashy crocodile bags and only a few would blink their eyes. If your ultimate motivation to get this ultra expensive bag is to get that Primadonna treatment, then think again. A Birkin bag works no magic, that’s for sure. The Birkin is named after actress Jane Birkin. It takes 18 to 25 hours by each craftsman to finish by hand a single Birkin bag. The skins that Hermes use to create various Birkin babies are: calf leather, ostrich, crocodile and lizard. Here are some of Hollywood celebs spotted with their very own Birkin bags. It’s pretty affordable when they go on sale! 🙂 I got a black Coach wristlet for $15 only after the additional 50% discount on the already discounted price! maybe in the philippines owning a birkin is no big deal, but in dubai, us and uk, i’d say it’s pretty recognizable. in fact it’s a head-turner. don’t confuse logos with prestige. iconic bags like the birkin are classic and earns its hype. doesn’t matter what season it is, have birkin, will travel/go places!